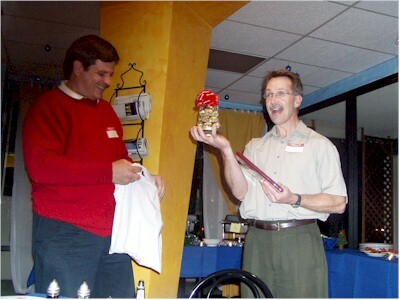 We presented Bill with a nice plaque and a bell full of chocolates for being the chair of our local Chapter of the A&WMA tonight at the Holiday Party. I got to do the presentation because I'm the incoming chair, giving Bill some relief after 2 1/2 years of service. The Holiday Party was special also because Scott went with me. His contribution to this site, as suggested by my friend Ed, is "What WAS for Dinner." The party was held at the Caffe Bella Italia, a nice Italian restaurant in Kearny Mesa, which usually doesn't serve dinner. For the second year in a row, they opened up just for our party, from 4-7 pm. Matt and Susan went up to the Wild Animal Park with Matt's Peer Counseling group to help out with something up there at the Festival of Lights. We'll find out exactly what they were doing up there later tonight.